To be fair to Keynes, as strongly as he emphasised ‘animal spirits’, he did also try to provide more of a material explanation. He saw the MEC also being determined by the relative scarcity of ‘real’ capital; relative to the needs of the general population that is. So capital accumulation growing faster than the population would cause the MEC to fall. This appears to be the situation in Britain in the run up to the Great Depression for Keynes. That is, the equilibrium position for capitalism is one of mass unemployment. Capitalism at full employment is only a ‘special’ case & the traditional marginal economists have confused this special case with the general theory, hence the title of his famous book, The General Theory of Employment, Interest & Money (1936). By going on an ‘investment strike’ & hoarding their money capital, the economy falls into a crisis. Monetary policy must lower r, or if the MEC is so low, fiscal stimulus is required with the government providing the necessary demand. The concept of money being ‘hoarded’ & therefore removed from the circuit of capital & a crisis ensuing is not unreasonable, at least not from a theoretical point of view. Those familiar with volume II of Marx’s Das Kapital should have no trouble comprehending this scenario. However, this all rests upon the money capital being realised labour values. If we imagine an economy based upon only commodity money, say gold coins, then we can see finance as being merely the reallocation of surplus gold coins (that represent realised labour time) to businesses requiring investment & who expect to get a return on this capital greater than the rate of interest being charged. Still today we are expected to believe that finance provides a useful function by moving surplus money to the most profitable investment opportunities & so maximising economic growth (whilst of course taking a slice themselves). The trouble with this imaginary scenario is it is a long way from reality. Even in the time of Marx, as the Banking v Currency School debate demonstrated, it was recognised that money could be created above & beyond the amount of commodity money. Indeed, banks very soon realised that they could create more bank notes than the amount of gold deposited in their vaults. Today with have many exotic forms of leverage, just look at the market for derivatives. We have QE (Quantitative Easing) exposing the class nature of the State as it buys up the government paper it previously sold to financial institutions, in an attempt to stop them going bankrupt & to enable them to keep buying more government paper. Cyclical crises are endemic to capitalism. Even a return to commodity money would not prevent capitalism from finding a way to leverage. Friedman’s steady rate of growth of the money supply in line with long-term economic growth, echoed by the so-called Positive Money School, cannot in practise be applied. Crises cannot be abolished & cannot be ‘solved’ by creating more ‘demand’ by printing more money that only extends the crisis of overproduction. 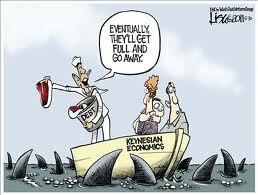 Keynesians do not understand the nature of the crisis nor provide any solutions. They cannot reform capitalism.